Happy birthday, America! This time last year I was on a train from New York City to Washington, D.C., and I've been remembering that ride through some of cities most closely linked to the war that led to our independence. It was getting dark as we passed Trenton, and fireworks were lighting the sky all along the route. As I thought about the people who supported the break from England, and those who didn't, I conjured up images of some of our early patriots. Who can think of the Revolution without thinking of George Washington? Many portraits of General Washington show him on horseback, and there's no doubt that he was an excellent horseman. Not only did he ride to get from here to there, but he rode for pleasure, too. He was an avid foxhunter and maintained a pack of hounds to which, when his schedule allowed, he rode three or four times a week. Washington also loved dogs, especially hounds. Oddly, few of his portraits include his dogs, but many written accounts mention his passion for his canine companions. 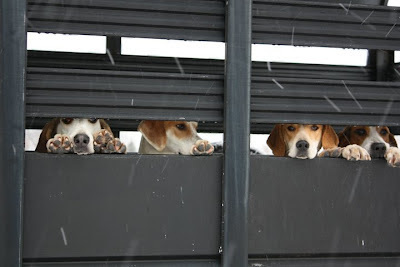 Washington himself wrote about his hounds in his journals and mentioned at least thirty individuals by name, including "Drunkard,” “Tipler,” and “Tipsy,” which makes me wonder what was going on in the kennels at Mt. Vernon! On a darker note, despite his own love of hounds and appreciation for human-canine relationships, Washington forbade the slaves at Mt. Vernon to own dogs, and punishments were in place if dogs were found in the slave quarters. It's hard to fathom that Washington and other champions of national independence could deny even the simple yet profound pleasure of a dog's love to people whose every other freedom they had stolen. Washington, like all the Founding Fathers, certainly had his faults. But we see with the benefit of historical perspective, and we should give him credit where it's due. 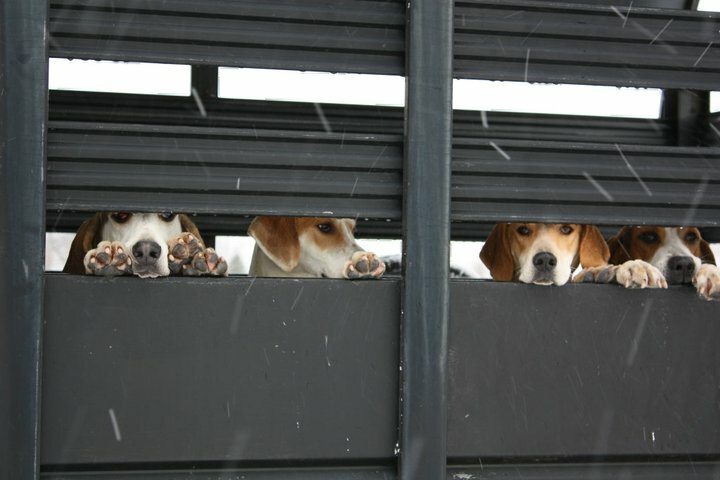 Did you know that George Washington is considered to be the father not only of his country, but of the breed we now know as the American Foxhound? 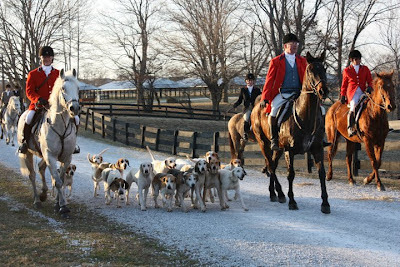 In 1770, Washington imported a number of foxhounds from England, and in 1785 the Marquis de Lafayette sent him several French foxhounds. 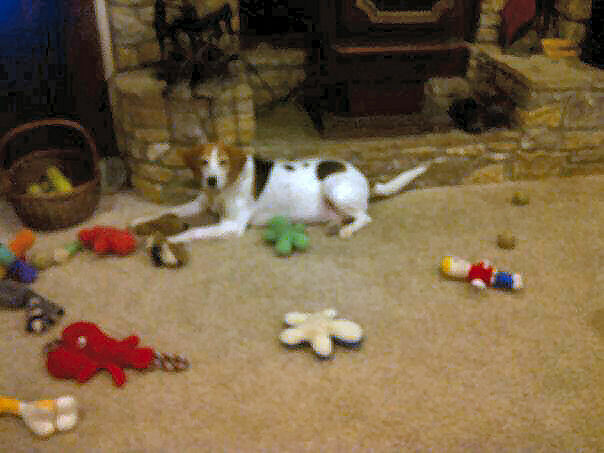 Through careful selection and interbreeding, Washington developed a type of hound suited to the terrain and conditions in Virginia, and that hound eventually came to be called the American Foxhound. ﻿﻿Another titbit I found has made me see old George in a softer light than suggested by his stern-jawed portraits. He had a favorite hound for many years; she was more pet than hunter, living with him in the house and often accompanying him on his travels. Her name, which makes me smile, was Sweetlips. Here I am at the Blessing of the Hounds, New Britton Hunt, near Indianapolis, October many moons ago - I was 15. 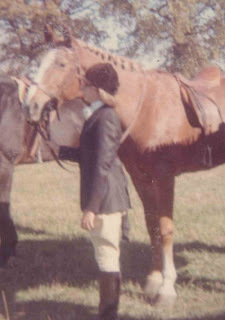 The horse was named Witch - my horse was injured and my coach loaned her to me for the Blessing. Keep your pets safe on the Fourth of July! More American pets are lost on the Fourth than on any other day, so keep them secure. Come back for Artsy Fartsy Friday - more horses! Fascinating post! What a complex man: he'd return a dog to his enemy, but not allow his slaves that simple pleasure. Thanks for sharing. We all engage in doublethink, but that certainly gives one pause, doesn't it?